After more than two decades of working in the car business, Hamud teamed up with his three brothers and his best friend to form Fort Worth Brothers LLC. It was their dream to buy a dealership, and when they found Alfa Romeo Fiat Fort Worth, they knew it was a diamond in the rough. Still, the purchase was not without risk. The showroom is just 12,000 square feet, hardly suitable for high-volume sales. “Originally, this was a Saturn dealership built for 60 to 70 cars per month, and before the purchase, there were only three salespeople to service customers. We had to restructure the showroom floor so there was enough room to bring in enough cubicles to handle expanding to 22 salespeople,” said Hamud. In addition to ramping up the sales staff, Hamud and his brothers identified and tackled four major obstacles that were severely hampering sales. Addressing these immediate problems boosted total sales in their very first month of operation significantly: from 12 vehicles in June 2017 to 110 vehicles in July 2017. Hamud credits much of the store’s instant success to its new employees. 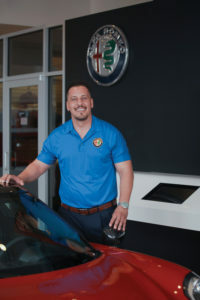 The majority of the staff hired at Alfa Romeo Fiat Fort Worth had long-time business relationships with Chris and the other owners. This gave them first-hand knowledge of skill sets, work ethic and dedication, especially when it came to finding talent in finance, accounting, sales and service positions. So far, the only outside hires have been salespeople. As the dealership has grown, Hamud has maintained his strong belief in promoting from within. His personal experiences helped shape his management philosophies today. When salespeople are hired, they are provided with a clear career path. All of the dealership’s assistant sales managers, finance managers and desk managers started on the floor. In addition to growing managers from within, Hamud and his brothers are committed to providing their employees with the tools they need for success. One of the first technology changes Hamud made after the acquisition was to switch the CRM to ELEAD1ONE. The CRM switch did not cause any upheaval at Alfa Romeo Fiat Fort Worth. “It’s hard to believe this dealership has been here 10 years, and they had just 800 records in their CRM,” said Hamud. At Alfa Romeo Fiat Fort Worth, those best practices include close management of the salespeople and their CRM activities. Two assistant managers are assigned to monitor the team of more than 20 salespeople all day, every day. The assistant managers diligently review and track tasks as well as outgoing and incoming emails, phone calls and texts. Whenever a salesperson struggles to close a deal, an assistant manager steps in or alerts a desk manager to assist with the deal. Another technology that drastically improved the dealership’s sales efficiency is phone communications. Prior to the acquisition, all of the dealership’s phone lines were directed to an outside location that struggled with managing the calls properly. “It was like they were ringing into a black hole,” said Hamud. After the sale, ELEAD1ONE helped to quickly revamp the phone processes. New phone numbers were set up and he retained ELEAD1ONE BDC agents to handle inbound calls for both sales and service. “We have 22 salespeople selling 275 cars per month, so they’re busy. I’d rather have the BDC take the calls and schedule appointments, so our salespeople can spend more time in front of our customers,” Hamud said. One year later, ELEAD1ONE BDC still handles all inbound calls and helps the sales staff with customer follow up and other activities. Another priority for the Fort Worth Brothers was marketing and advertising. The first step was to budget $20,000 per month for Google search to establish the Alfa Romeo and Fiat brand names in the local market. The dealership spends an additional $80,000 per month on all other marketing activities, including email, website optimization, advertising, third-party leads and special finance leads. “We pretty much do it all,” said Hamud. Their strategy includes community and events outreach. The brothers recently signed a deal with the Texas Christian University (TCU) Horned Frogs football team to promote dealership specials on stadium billboards. So what is the real secret sauce to their success? A strong focus on creating new fans for both Alfa Romeo and Fiat brands. Alfa Romeo Fiat Fort Worth aggressively advertises its used car inventory to attract car shoppers to their lot. Once there, the salespeople introduce them to the Alfa Romeo and Fiat brands and encourages them to take a test drive, just for fun. This strategy has helped propel the store’s Fiat sales from seven new cars in June of 2017 to 175 new cars in June 2018. Turning their customers into loyal brand supporters of Alfa Romeo and Fiat has delivered an unexpected side benefit: branded product sales. 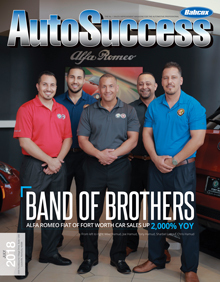 When the Hamud brothers purchased Alfa Romeo Fiat Fort Worth, they felt they were pushing the envelope when they set a sales goal of 200 vehicles per month. They surpassed that goal by nearly 40 percent within nine months of taking ownership. Next on their agenda is to focus on growing service revenue. The service department has already benefitted from the growth in sales volume. In the last year, fixed ops revenue has increased from $40,000 per month to $100,000 per month. Hamud’s goal is to boost service profits another 50 to 60 percent per month. To help him accomplish this goal, Hamud partnered with ELEAD1ONE. 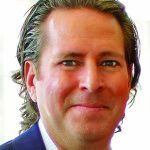 The dealership already leverages the AutoPilot service marketing platform for customer retention and to recapture previously declined services. In order to provide their new customers with a first-class service experience, Hamud knew he would need to implement the latest fixed operations technology. Hamud recently opted to implement ELEAD1ONE’s service retention suite, Service1One online scheduler, lane and shop management tools that seamlessly integrate with the CRM and service marketing program. This added technology will fully close the gap between sales and service to get a better view of the customer and help surpass their service revenue goal. 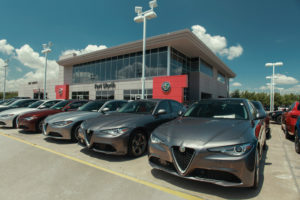 The service department at Alfa Romeo Fiat Fort Worth will soon be using mobile tablets for the check-ins, walk-around write-ups and multi-point inspection (MPI) processes. The service department also provides its customers with a host of upscale amenities, including free loaner cars, WiFi and waiting lounges stocked with snacks and beverages. Click here to view more solutions from ELEAD1ONE.